The oil price is rising due to the upcoming restrictions on the sale of Iranian oil – the second of a two-part set of sanctions imposed on the Middle Eastern power following the Trump Administration’s decision in May to withdraw from the Iran nuclear agreement, known formally as the Joint Comprehensive Plan of Action (JCPA). Sanctions lifted under the Obama Administration were re-imposed. What should inflation-prone countries do with their economic fortunes and the plight of their populations, at the mercy of fiat exchange rates and a strong US dollar? The answer may be simple: just establish a currency board. Trump said the deal was disastrous for the United States and a security threat. He also said Iran wasn’t following through on a number of changes it agreed to make, such as more diligent inspections, including Iran’s ballistic missile program in the agreement, removing Iran's presence in Lebanon, and stopping funding terrorist groups like Hezbollah. Some say the real reason for re-imposing sanctions is to change the clerical Iranian regime – a view shared by US Middle Eastern allies, Saudi Arabia and Israel. At any rate, in August restrictions were imposed on Iran’s purchase of US currency, trade in gold and other precious metals, and the sale of auto parts and commercial aircraft. November 4 is when sanctions on the sale of oil and petrochemical products, take effect. This is the date everyone is watching, since the restriction of Iranian oil is likely to bump up oil prices, particularly the Brent crude standard. This, however, is anything but certain. While oil companies have until the 4th of November to reduce their purchases of Iranian oil, China, India and several European countries have said they won’t cut their imports, preferring to honor the JCPA. The sanctions have affected the Iranian economy, but not dramatically. Yet. That’s because high oil prices between 2008 and 2014 allowed the country to build up a whopping $132.6 billion in foreign exchange reserves. However, the economy is 80% dependent on oil sales, so the oil restrictions are bound to bite. Inflation currently sits at around 10% but the prices of certain other goods have gone up considerably more as the black-market US dollar to rial exchange rate plummets. 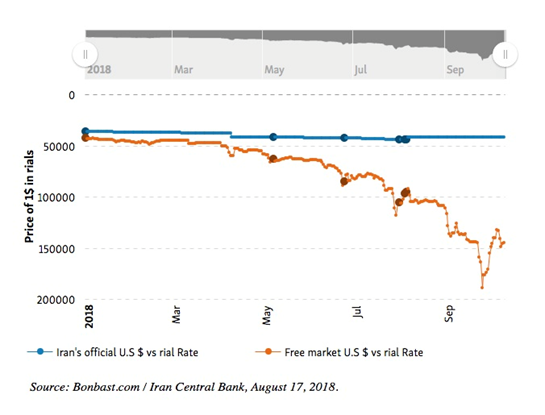 Iran has both an official USD to rial exchange rate and a “free market” rate. Pork for example has risen 14%, eggs have gone up 54%, dairy products by 18% and fresh fruit by 64%. Meanwhile in Turkey, on which the United States has also levied sanctions due to a rift caused by the detention of an American pastor, inflation is worse. In August the inflation rate in Turkey nosed up to 17.9% – the highest in 15 years. But the big hit has been against the US dollar. The Turkish lira has dropped 42% this year against the greenback as investors sell the currency, having lost confidence in President Erdogan’s ability to control the economy. That makes imports of needed commodities and goods priced in US dollars more expensive. Prices are rising even higher in Argentina, where inflation hovers around 30% due to an economic crisis that has also caused a run on the peso, but the real inflation basket-case is Venezuela. There, consumer prices have risen 488,865% in the 12 months ending in September, Reuters reports, with daily inflation running at 4%. President Nicolas Maduro in August cut five zeros off the bolivar, mimicking what Zimbabwe did in 2008 – eliminate 10 zeros off the Zimbabwe dollar while inflation was running at an annual 2.2 million percent. What are all these inflation-prone countries to do, with their economic fortunes, and the plight of their populations, at the mercy of fiat exchange rates that are being slaughtered by flights of capital and a strong US dollar? The answer may be simple: just establish a currency board. A currency board is like a central bank, but it only issues bills and coins, which are convertible into a reserve currency, be it gold, the US dollar, the euro, etc. The reserve currency should be stable and easily convertible. Typically, the reserve currency board would hold low-risk securities that earn interest. Where a currency board differs from a central bank is that the currency board by law is required to have a fixed exchange rate between the country’s currency and the reserve currency, and hold reserves equal to its monetary base. For example, if a country has 100 billion units of its currency, which are worth 70 billion US dollars, the currency board can’t inflate or deflate the value of its currency, say to increase exports. The local currency is anchored to the reserve currency. This means the only way a currency board can raise funds is through taxation or borrowing. It is not allowed to print money. A quantitative easing program – like happened in the United States, the European Union and Japan – would not be possible under a currency board. Monetary policy under a currency board is determined by supply and demand for the local currency, not by targeting an inflation rate or interest rate – which is what central banks do. In this way, a currency board is an excellent way to control inflation. Neither is a currency board the “lender of last resort” like the Federal Reserve, which loans money to other banks. It simply issues bills and coins, and converts the local currency to the reserve currency at the set exchange rate. Most people have never heard of a currency board, but they have existed in 70 countries, with several still operating today. The first one was installed in Mauritius in 1849, when it was a British colony. As Steve Hanke, a contributing writer to Forbes, wrote recently, “No currency board has failed.” Hanke gives another example, the National Emission Caisse, established in 1918 in Russia during its civil war, which issued “British ruble” notes backed by pounds sterling. The father of the British ruble was none other than John Maynard Keynes, who then worked for the British Treasury. Gold is the ideal reserve currency, which is why a gold-backed currency board makes a lot of sense. The ancient Chinese, Lydians (in Turkey), Greeks and the Romans all used gold as money, with the Romans acknowledged as the first civilization to employ gold as a currency across their vast empire. Historical records show Emperor Julius Caesar brought back so much gold from a victorious campaign in Gaul to give 200 coins to each of his soldiers and pay all of Rome’s debts. In 1944 at Bretton Woods, New Hampshire, delegates from 44 nations met and agreed to peg their currencies to the US dollar, the only currency strong enough, just after the war, to meet the rising demands for international currency transactions, as shattered economies got back on their feet. In 1971 US President Nixon ended the convertibility of the dollar into gold for central banks, effectively demolishing the gold standard. 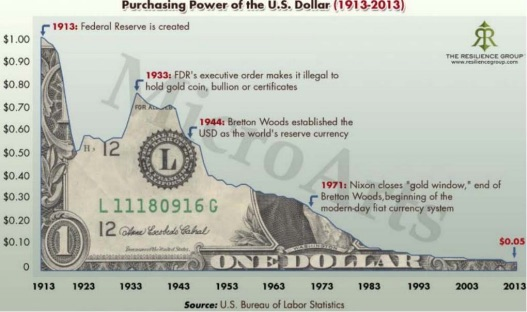 The Bretton Woods system collapsed and gold was allowed to trade freely without a US dollar peg. Investors love gold because it tends to hold its value through time. They see gold as a way to preserve their wealth, unlike paper or “fiat” currencies which are subject to inflationary pressures and over time, lose their value. For more on the history of gold, read our Imaginations of the Misguided, and for a history of the dollar and why it is losing is privileged status as reserve currency read The beginning of the end of the dollar. In that article, the author notes that since 1979, Iran’s trial has lost close to 100% of its value. He argues that the most elegant solution to Iran’s weak currency and high inflation (around 20% in 2017) is to switch to a gold-backed currency board. Doing this would allow Iran to use a “currency” (gold) not controlled by another sovereign nation, while still retaining the rial. Everybody wins. Of course they didn’t do that, and as noted above, Iran’s economic problems are just beginning, and are bound to get worse, as sanctions begin in November on its oil sales. Hanke’s suggestion also applies to Venezuela, Argentina, Turkey, Russia, or any other country whose currency is weak, but does not want to depend on a foreign power for fixing its local money to a reserve currency. Gold is apolitical. 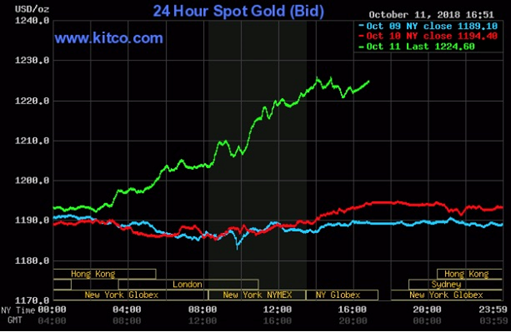 The value of gold as a safe haven continues to ring true. Earlier this week we saw a steep selloff in global stock markets, causing gold to rally – along with weaker-than-expected US inflation numbers, indicating that the Federal Reserve may not be as aggressive in raising interest rates going forward. Will countries suffering from high inflation take our advice and move from a central bank system to a currency board, ideally backed by gold? Probably not. But with gold continuing to hold its value ($1,200+), despite major headwinds, including a high US dollar, continued demand for Treasury bills, US interest rate hikes and falling demand (For more on gold’s woes, read our Gold and the great stage of fools), they would be wise to. Along with all the other reasons to own gold (store of value, inflation hedge, safe haven) switching to a gold-backed currency board is a sure-fire way to control inflation and put them on a road to recovery.